Mac computers running OS X might find that their scrollbars disappear in their web browsers after a few seconds of inactivity. 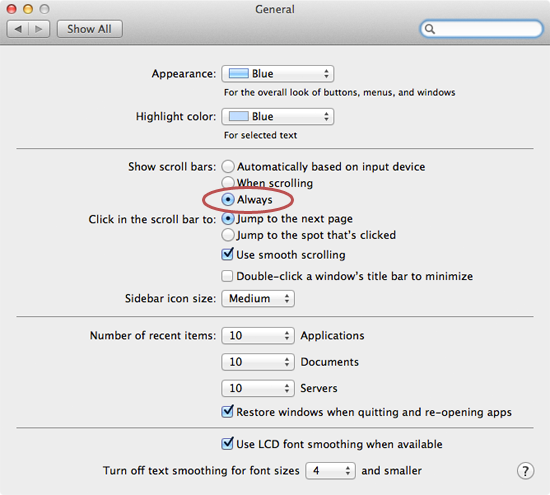 This forum will explain how to disable the automatic disappearing scrollbar setting for Mac computers and have it show all of the time. 2. Click General. Once you click General the following menu will appear. 3. Set the Show Scroll Bars setting to Always. Once you close System Preferences all changes will be saved and scroll bars will no longer disappear.